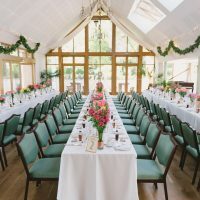 Nestled in 11 acres of idyllic semi broadleaf woodlands, Larmer Tree Gardens provides a tranquil and unique setting for civil ceremonies and weddings. Established in 1880 the extravagant gardens were created for ‘public enlightenment and entertainment’ and are now considered a garden of national importance. Today as you stroll through the grade II listed grounds you can enjoy the sight of roaming peacocks and a pair of macaws. 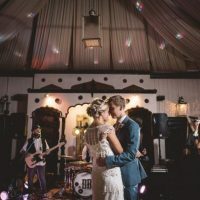 Choose from five delightfully quirky licensed buildings in which to hold your civil ceremony. Dependant on guest numbers you can tailor your celebrations to suit your needs and tastes. Neutrally decorated, the New Pavilion provides a blank canvas for your choice of decorations. The wrap around windows create a light and airy space that benefits from beautiful views overlooking the gardens. The Jubilee Hall is decorated in neutral tones complementing a wide range of decorations. Floor to ceiling windows, wooden floor and draped ceiling lend to a cosy and intimate ambiance, despite the generous size of the setting. 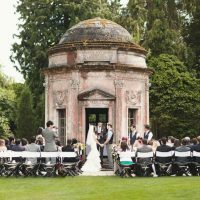 For the most intimate celebrations, the stunning Roman Temple is ideally suited for outdoor ceremonies. Set in the heart of the gardens, the ancient structure provides a breath-taking setting for couples to say I do. The Lower Indian Room is truly a unique example of Victorian opulence. Black and white exposed wooden beams, intricate wooden carvings and balcony add to the charm of this remarkable setting. Endlessly versatile, the Lower Indian Room suits small intimate gatherings or larger celebrations that spill out onto the well maintained lawn. A charming setting catering for up to 14 guests, the General’s room features intricate wood carvings, paneled walls and antique furnishings. 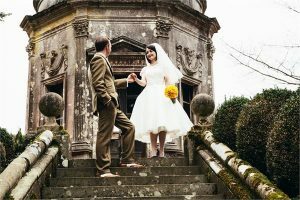 Larmer Tree Gardens understand that every couple is unique which is reflected in their approach to packages. Exclusive use allows couples to tailor the perfect celebrations to suit their needs and taste. 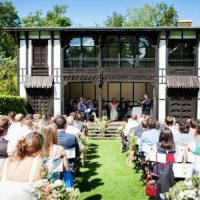 Secret Garden weddings are held throughout the week for up to 30 guests and are perfect for simple, affordable ceremonies. The experienced catering team use the freshest locally produced and seasonal produce to create a menu to tantalize the taste buds of your guests. Whether you fancy a summer barbecue, international buffet or formal sit down meal, the choice is yours. To discuss your needs please call one of the friendly events team or use the online enquiry form.